Newspaper Desktop is an amazing skin for old school type people who still loves to read newspapers. This Rainmeter skin impersonates newspaper style by displaying latest news, name and time header, and other information like space bounder, RAM usage, Network Statistics, weather forecasts and a lot more. This Rainmeter skin provides clearness and frosted glass effects to the desktop. For best and detailed results it should be paired with simple and minimal wallpaper. It shows information such as RAM and CPU usage, date and time, RSS Feeder, Network Statistics, weather forecast of 3 days and so on. Enigma goes with almost every wallpaper and you can style it as per your desire. It displays information which includes multiple RSS feeds, RAM and CPU usage, Media playback control, real time active processes, picture slideshow, Weather, world time, quick notes and Whatsoever you can think is there to display at your desktop. Being able to provide so many features enigma was Rainmeter’s default skin in 2009. Tech-A is just an amazing and resourceful skin by being futuristic. It is the best Rainmeter skin for the people who need all the information about their system and its working right there on the desktop within an animated core. The stuff it shows includes date and time, RAM utilisation, CPU usage, etc. and providing shortcuts for various system folders as well. Razor is one of those skins whose working depends highly on what kind of wallpapers a person is using. The decision of putting a correct wallpaper can do wonders for your desktop look. It provides information such as Power status, Network strength, Customizable dock, shortcuts of system libraries and some info in combinations like time and date header and weather. This Rainmeter skin does justice for the people who are in favour of clarity and seeing information with a grace. Senja Suite provides very minimum and basic things such as Media information with control buttons, Shut Down/Restart/Log off options, Slideshow of favourite pictures, system folder shortcuts and time. People who loves glowy and animated informative display, then Neon Space is the right choice for those. It provides info such as CPU and RAM usage, Date and Time, Calendar, Climate condition with 3 day forecast with a bunch of fake display information too. The look of this skin is totally as if a you are entering into real space. Eker Lina is one of those skins which provide a very neat and clean information to the users. You can customise it as required in different layouts. And the stuff it shows consists Media control, Time and Date, Weather conditions, RSS feeds, drive and system folder shortcuts and other sorts of data. Pairing this skin with the right wallpaper can get the users to take full and proper advantage. The information displayed under this skin is date and time, Power status, Network upload and download speeds, disk partition shortcuts along with the activity of module configuration too. Before dawn is one of the simplest Rainmeter skin available. It shows all the information in the centre of the display very neatly without creating any chaos. It’s informative in the areas of Time and Date, temperature, current location, Subscribed RSS feeds, shortcuts to frequently accessed programs and websites. When you say simply beautiful the only Rainmeter skin that comes in mind is UNITY. It a standard normal functioning skin and displays information similar to other skins like system folder shortcuts, time and date, media playback control bar, Weather conditions in sub-modules. Like its name ELEGANCE 2 depicts information in an extremely graceful manner possible and its the right choice for all the simplicity lovers. It displays information about Recycle Bin items, and other stuff like Date and time, Media and playback control and RAM and CPU usage in a very readable designed font. LIM!T is an awesome Rainmeter skin for the people who don’t like their desktops messy filled with loads of content. In this, the text fills up as the value grows. It shows information like CPU and RAM usage, current media playback status, Date and time and weather conditions in the text. The need of right wallpaper is required to make WISP worth using. In this skin there is no boundary or widget to convey specific information and details, it appears as they are drawn. It displays information in featuring modules like RAM and CPU usage, Network bandwidth consumption, Date and Time, Temperature, Disk partitions’ space usage, etc. It’s an honour to obtain and use IronMan-Jarvis Rainmeter skin for all the Iron Man admirers in the world. It has very dynamic customizable features where users can even change the module positions as per their suitability.It conveys data such as Hard Disk capacity, temperature, RSS feeds, Time and Date, and some folder shortcuts too. This skin has modules such as Hard disk information pane, media playback, control panel, date and time and Network statistics graph. All of the modules can be tailored as per the user’s wish. It’s a gift for all the fans of the game MASS EFFECT developed by the company BioWare as it gives the feel of being a part of the game whenever a person uses their system having this Rainmeter skin. Its a pretty amazing thing to have a Rainmeter skin inspired by the Avengers. The display shows things like media playback and control bar, Shutdown and Restart buttons, RAM and CPU usage status, volume buttons, and many more. All this comes in a super cool Eagle shield tag and it also provide shortcuts to regularly used applications like media player and browser. Everything is in multiple resolutions which makes it more realistic. This is an appropriate Rainmeter skin for those who likes to have huge amount of content on their desktop and can manage that. It is available in light and dark both versions and seems to be attractive for a good lot of people. The data it depicts includes System folder/Disk partition shortcuts, RSS feeds, Date and time, Power status and so more. This is a very soothing Rainmeter skin and it shows your systems’ temperature with other data like percentages of RAM, CPU, SWAP and Gmail messages too.It is a new skin and comes in two versions which are x86 and x64. Simple Media is as simple and sleek as the name suggests. It suits every kind of wallpaper or we can say it blends well with everything through its bold bonds. It depicts very basic stuff in multiple variants which are Time and date, Current Temperature and the Recycle Bin status. Battlefield 3 is a gaming theme which is best for the users who need to custom their system into an original gaming console to enjoy proper visual effect. On the right side of the window there is a custom side bar where you can insert your favourite apps, best shortcut keys, cloacks, calender and regular weather updates and other widgets. 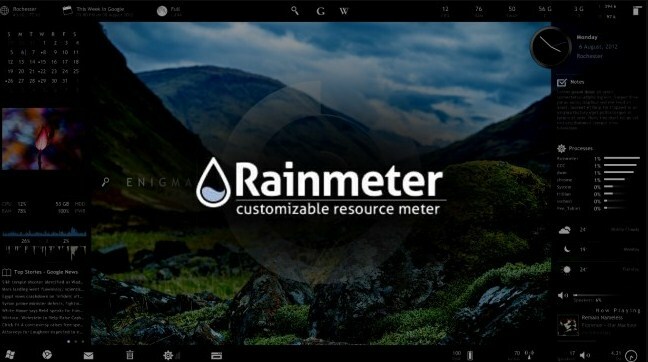 Windows 2019 is a very popular rainmeter skin among window users. Proper arrangement for decorating the desktop and providing access to your favourite apps on a single clck is its main feature. You can choose the customized icon to change the look of your default icons and get news feeds, weather updates, music control, etc and current updates of mail notifications, weather, and much more through an online connection. Obsidian makes the screen looks like an architecture model with step wise blocks placed in order of the frequency of use of apps. It gives a very splendid visual look. You can pick any app and widget and place it on the screen in the form of blocks to get instant access. It is the best rainmeter skin if you want to run your PC in a user friendly interface. End of the world is a rainmeter skin based on the end of the world actually. Therefore everything in it is imaginary be it be the wallpapers with broken half sized destroyed earth to the dark and deadly visual effects. But all these things are customizable from background to widgets, icons, clock, calender, etc. Darkness Falls is the rainmeter skin best suited for those who likes dark modes only. Your PC transforms into a dark interface including wallpaper, widgets, icons and everything. You get all customized widget, an on and off button on the panel below and experience the best visual effects.